Puffs of flavored smoke permeate restroom stalls as a cluster of students stroll out, hall passes in hand, and head back to third period. A friend is spotted coughing into his elbow after taking too big a hit on his flash drive-shaped device. Vape has settled into Diamond Bar High School campus culture almost as much as rigorous academics and college anxiety. Those who haven’t done it probably know somebody who has. Still, few Brahmas are ever caught in action. According to Hong, a fire alarm is occasionally triggered from e-cigarette vapor. But those instances occurred more often when vaping was a fairly new development, and students of recent years have managed to refine their skills when it comes to concealing the activity. The extent of disciplinary consequences for those who are discovered vaping varies depending on what’s in the product—nicotine and THC are prohibited under state education code regardless of legality—as well as whether the student is a repeat offender. Punishments range from receiving an in-school suspension to a home suspension, according to Hong, along with parental notification. “As classroom teachers, I think it’s really challenging because you want to give students opportunities to work independently on things,” Hong said. 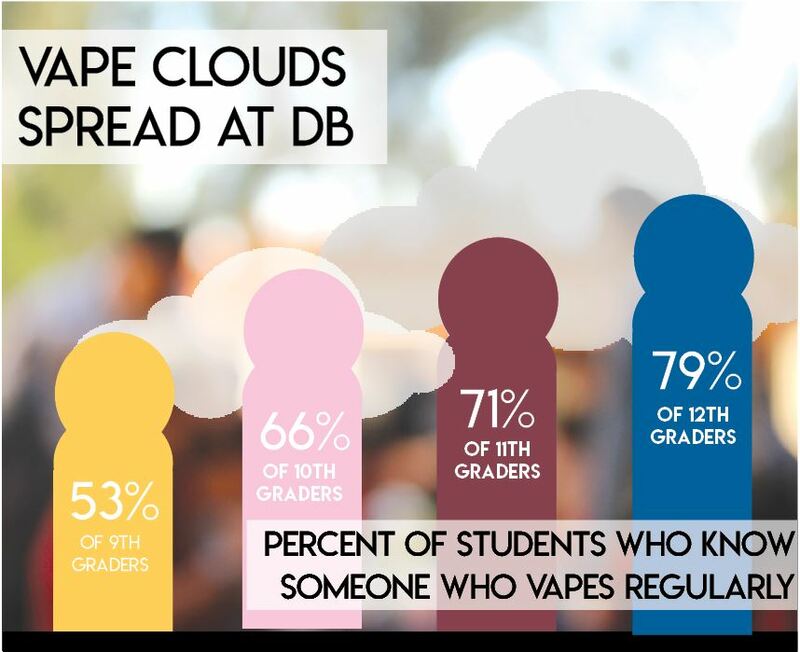 Vape is not a predicament unique to DBHS. In 2015, the CDC reported that almost one in four teenagers vape, and, in 2018, FDA Commissioner Scott Gottlieb publicly called the situation an “epidemic” among American youth. So what is it about these devices that hooks teenagers? Most e-cigarettes do contain nicotine, though not all. JUUL, a leading provider of e-cigarettes, uses nicotine salts in its pods. Some students say they simply find amusement in manipulating the vapor. “[The fun of it is] having a lot of smoke coming out of your mouth and you could make shapes, like the circles and everything,” another senior said. 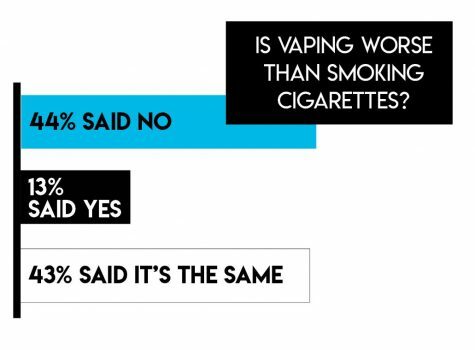 Others, however, rely on vape devices to help curb their cigarette addiction. One senior recounted first smoking hookah and cigarettes earlier in her high school career before introducing herself to vape toward the end of junior year. These students come closest to fulfilling the intended usage marketed for by major vape companies: employing e-cigarettes as a safer alternative to the real thing. It provides the nicotine dosage without the tobacco, tar or other impurities. But most high school age e-cigarette users are not looking toward vape as a path to tobacco cessation, as according to a 2017 study by the CDC, about 50 percent more teenagers vape than smoke.